Blake Morgan moved to New York City as a young southern Californian girl. While many of her roommates had family nearby, Blake found herself with no support system and found herself needing to make her way. 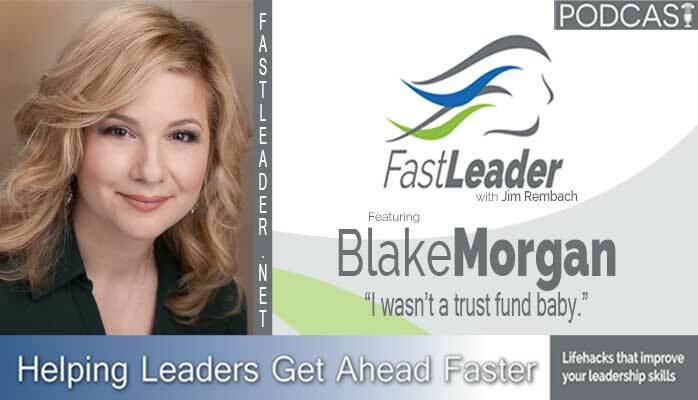 Listen to Blake tell her story of how getting over that hump affected her career and life. Blake Morgan is a customer experience adviser that has worked with Intel, Verizon Wireless, Verizon, Newmark Knight Frank Retail, One Medical, Misfit Wearables (Shine), Pega Systems, Clarabridge, Zendesk, Sparkcentral and more. She’s highly involved with SOCAP where she serves as the VP of Marketing for the North West chapter. She loves “customer experience” because as humans we are feeling, sensing beings. Our most vivid memories are powerful experiences. Today brands understand that creating a knock-your-socks-off digital experience is the way to the customer’s heart. Outside of work she volunteers with Hop-a-long Animal rescue managing their Twitter account–helping dogs get fostered and adopted in the San Francisco Bay Area. In a past life she lived in NYC for five years–then met her now husband at a CRM conference and moved to the bay area in under two weeks. Good thing it worked out! Today she loves calling the bay area home. Other fun “Blake” facts, she once ran a marathon in San Francisco. She takes Russian Language classes so she can understand her husband’s family. Blake enjoys hanging out with her husband and Yorkie, Athena in Oakland, CA. It’s so important for people to have a brand. It’s really important to have your own personal brand. Be yourself. If you’re trying to be someone else it’s really obvious. Being a good listener. Listening is everything.